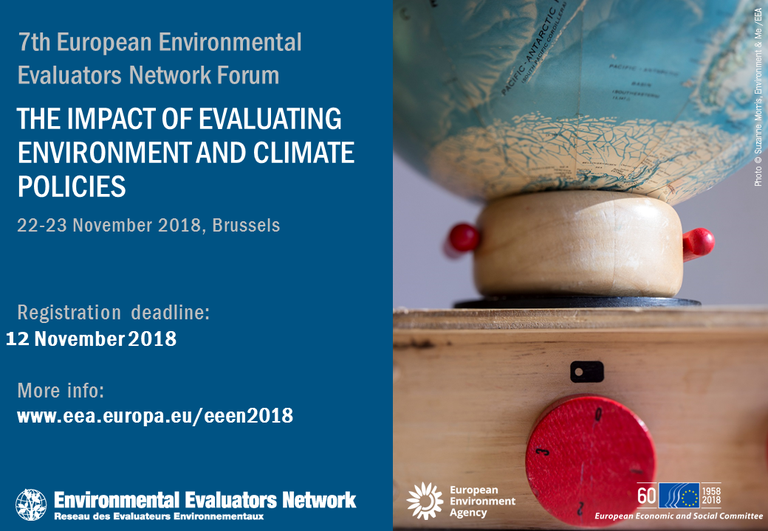 The 7th European Environmental Evaluators Network Forum (2018 EEEN Forum) brought together evaluation practitioners, academics, policy-makers, representatives of civil society and other users of environmental evaluations to share views, knowledge and experiences about the impact of evaluating environment and climate policies in recent years. In order to achieve the goal set out in the 7th Environment Action Programme of “living well, within the limits of our planet”, the European Union and its members states have put in place a range of environment and climate policies. These seek to address the challenge of turning Europe into a resource-efficient, green and low-carbon economy. The 2018 Forum reflected on how environment and climate policies are serving these societal and environmental challenges, focusing on the evaluation of these policies and the impact of the evaluations in the policy cycle. The 2018 Forum focused both on the evaluations of the impact of environment and climate policies and on the impact of the evaluations of environment and climate policies. Developing the necessary knowledge base is one of the key challenges to find out whether policies are effective in serving their purpose. Even more important is the way that developments in the knowledge base are communicated. Which stakeholders are being addressed by evaluation results? What do evaluators communicate and how should they communicate? If we want to increase the efficiency of our investments, we need to improve knowledge on the socio-economic impact of environment and climate policies. Do evaluations sufficiently address these socio-economic aspects? As the focus on finance and investments for sustainability intensifies (not least the Sustainable Development Goals), what are the challenges for the evaluation community? As environment and climate policies are developed and implemented at many levels – international, European, national, regional, local – there are many different levels at which legislation is being evaluated. What can the European environmental evaluation community learn from others, including international, national, or regional actors? What can be learned from other policy areas? Can we learn from the different methodologies being used and their impact? How do evaluations of environment and climate policies address the challenges of the future, including the fact that many policies are interlinked and that we experience synergies and trade-offs between them? How do evaluations deal with the integration dimension? Does the integration dimension influence the methodologies needed? How do evaluations deal with the need for systemic approaches needed for the transition towards circular economy, bioeconomy, low-carbon economy? At the European Environment Agency, we are committed to protecting and respecting your privacy. Please refer to the Specific privacy statement for further information on how your personal details are collected and further processed. The event was co-hosted by the European Economic and Social Committee and the European Environment Agency. The purpose of the international Environmental Evaluators Network (EEN) is to advance the practice, policy and theory of evaluating environmental programmes, policies and other interventions. Since 2012, the European Environmental Evaluators Network (EEEN) has been organising Fora to promote more systematic and collective learning in these areas. For references, please go to https://www.eea.europa.eu/themes/policy/events/7th-european-environmental-evaluators-network-forum/7th-european-environmental-evaluators-network-forum or scan the QR code.